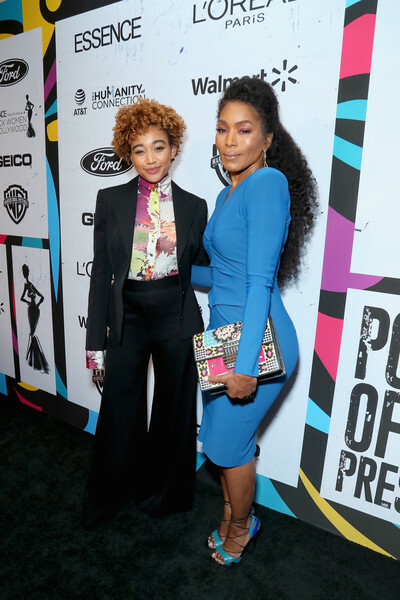 Amandla Stenberg (L) and Angela Bassett attend the 2019 Essence Black Women in Hollywood Awards Luncheon at Regent Beverly Wilshire Hotel on February 21, 2019 in Los Angeles, California. Amandla Stenberg teamed an Ellery bell-bottom pantsuit with a floral blouse for the 2019 Essence Black Women in Hollywood Awards. Angela Bassett punctuated her blue outfit with a mixed-print clutch by Etro. Disclaimer: No celebrity endorsements are implied by our editorial.